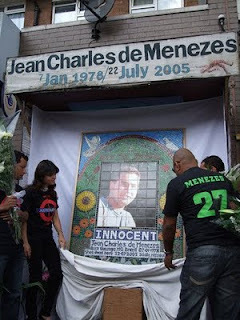 Off out now, but I've been meaning to publicise the efforts by the Justice4Jean Campaign, which I am a member of, to persuade Transport for London and London Mayor Boris Johnson to allow a mosaic of Jean Charles de Menezes, created by artists from the local area, to be erected outside Stockwell tube station as a permanent memorial. The campaign has launched an online petition, which as of today has 683 signatories. Negotiations are currently under way for Jean's family to meet Boris, so please add your support and push the total up to 1000. Excellent stuff - just signed it.